CCHR: Bookstore, Just Because You’re Depressed Doesn’t Mean You Have Depression. Postpartum depression is a hormone imbalance and not an indication for an antidepressant. How certain untreated allergies can affect your mood and make you feel depressed. How your depressed symptoms might actually be from an underactive thyroid gland and why your doctor may not know how to accurately evaluate it. Which nutritional deficiencies can cause you to feel depressed. Other underlying causes that may be making you feel depressed and what you can do about them. 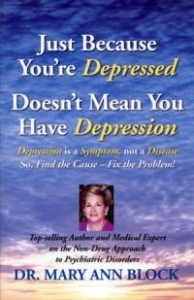 “This book is a must read for those who have been diagnosed with depression. This book gives the reader all the information they need to make the best choices about how to find the real cause of their symptoms. I highly recommend this book by Dr. Mary Ann Block.” — David Brownstein, MD, author of Overcoming Thyroid Disorders, Drugs That Don’t Work and Natural Therapies That Do.